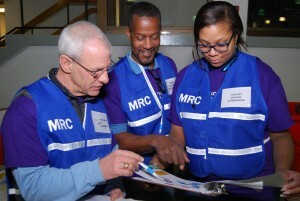 The Medical Reserve Corps (MRC) was established in 2002 as a national network of volunteers, organized locally to improve the health and safety of their communities. The MRC network comprises 987 community-based units and almost 200,000 volunteers located throughout the United States and its territories. Recruit health care professionals and volunteers in supporting roles. Create a framework to match volunteers’ skills to address community needs. Train volunteers to respond effectively to local emergencies. Provide reserve capacity to respond to local, state and national public health needs.